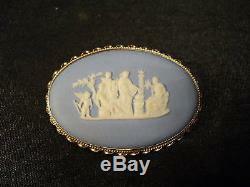 Welcome to Antiques & Moore! 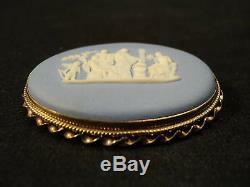 This listing is for a fabulous vintage Wedgwood Jasperware brooch with 14 K yellow gold mounting. 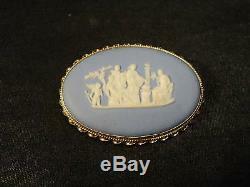 This cameo carving is of a classic figural group with cupid on a blue jasperware background. 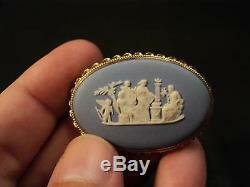 The Jasperware back is stamped with impressed mark "Wedgwood, Made in England" and the mounting is stamped "14 K". Measures 1 3/4" wide and 1 1/4" high. 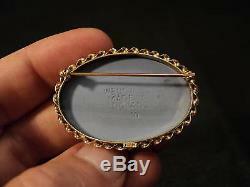 This nice brooch is in excellent Estate condition with no noted flaws. We at Antiques & Moore have been in the Antiques business for over 30 years and try to describe our items as accurately as possible. We are happy to answer any questions and always appreciate your business! 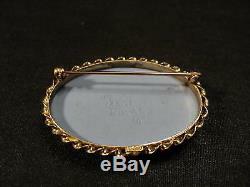 The item "VINTAGE WEDGWOOD JASPERWARE BROOCH, 14 K GOLD MOUNTING" is in sale since Monday, June 28, 2010. 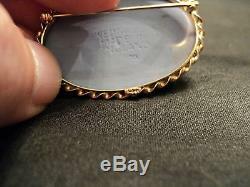 This item is in the category "Jewelry & Watches\Fine Jewelry\Fine Pins & Brooches\Precious Metal without Stones".